Limit 4 per person. Must make tee time; subject to availability. Not valid before 10AM on weekends and course holidays. Not valid for leagues, outings, cash back or with any other offer. Expires 7/15/2019. A stunning 18-hole course that shows off the best of Pennsylvania golf, Greencastle’s exceptional course should be on your calendar for this season. South central Pennsylvania is home to many different golf courses, but today’s feature course, Greencastle Golf Club, stands alone as one of the best. Family owned and operated, the team at Greencastle has not only set themselves the goal of providing all who visit with a fantastic golfing experience, but also redefining what public golf means. On both counts, the Powers family and their team have achieved wild success. Trust us: once you step out onto Greencastle’s phenomenal championship 18-hole course, you’ll wish you had visited many years sooner. 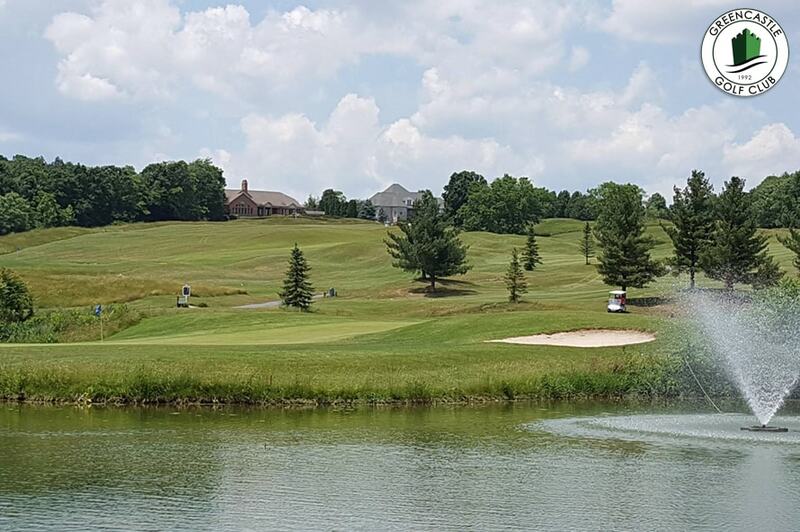 Located just off of Interstate 81 and just a short trek from Interstate 70, Greencastle’s stunning course is not only easy to love, but also easy to get to from Hagerstown, Chambersburg, Shippensburg, and even Frederick, Baltimore, and Washington, D.C. Playing just short of 7,000 yards from the back set of tees, the course is wonderfully conditioned, and takes you through and odyssey of challenges designed partly by a brilliant course designer and partly by Mother Nature herself. The layout mixes long holes and drastic doglegs with densely wooded areas and pockets of water located all throughout. There are several forced carries, several risk vs. reward opportunities, and many chances to make or break your score with your next swing. The course is also aptly named, as Greencastle’s smooth-rolling greens are fit for royalty. To truly experience all that Greencastle has to offer, we highly recommend spending some time exploring the great on-site amenities. For practice, you’ll find a full-size driving range, expansive practice green, and a fully stocked pro-shop. For your 19th hole celebrations, the Fireside Pub offers exceptional fare in a casual and relaxed atmosphere. Don’t let the 2019 season start without a plan to visit Greencastle’s excellent course – reserve your round now!